Continue to be impressed with the attention to detail and the quality excellence of everything Vega-Sicilia does. They now have 5 wineries producing Vega-Sicilia & Valbuena since 1915 (100th anniversary next year), Alion in Ribera Del Duero 1991, Tokay-Oremus in Hungary 1993, Pintia in Toro 1996, and Macan in Rioja 2003. Another visit last week to Vancouver of my friend Export Director Puri Mancebo-Lobete was a good opportunity to catch up. She started at the Tokay project 2001-2002. However I have been following them before that and they did a superb wine tasting in San Juan, Puerto Rico led by Don Rafael Alonso for IWFS on April 25, 1998. Many old IWFS shakers and movers were there including Angel Del Valle & Carmencita, Pedro Pumarada & Carmen Teresa, Larry Fleisher, Joe Garrigo, Alec & Irene Murray, Caryl Saunders, Bob & Ellen Gutenstein , Bob & Beth Charpie, John Avery, Ed Lazarus, John & Muffie Hoche and so many more. Vertical of Unico included 85, 81, fantastic 70 (16 years in wood), 68, and 53. Even served 1975 Oremus Aszu 5 Puttonyos wine they had purchased before starting their own label. Many other tastings with winemaker Xavier Ausas, especially their Managing Director Don Pablo Alvarez including awarding him a Lifetime Achievement Award in Society of Bacchus at their Vega Sicilia winery in May 2004 and his 5 decades presentation for the Vancouver International Wine Festival on March 30, 2011. 1. Vega-Sicilia, Unico, Reserva Especial, & Valbuena: Top of the pyramid. Just released 2004 classic Unico in the style of 1968 & 1970. 1999 Unico starting to develop but still so young. They have a long history of an ability to make wine to age and three important keys are poor chalky soil with low yields, fresh good balanced fresh acidity and special winemaking techniques in wood (21 big vats). Puri says they still have 1912 and 1917 Unico in the cellars and she just tried a sensational 1934. Three vintage blend of 1994, 1995, and 2000 in their current Reserva Especial release. Really like how they still hold back a lot of wine to top up the casks every Friday to avoid oxidation from the long time the wine spends in wood. Unico not produced every year and then goes into usually younger vines Valbuena (95% tempranillo & 5% merlot) in such vintages as I believe 1984, 1988, 1992, 1993, 1995, 1997, 2001. 2. Alion: 2009 biggest release ever of about 320,000 bottles. Modern international personality of 100% tempranillo (tinto fino) with 12 months in new French oak. 2009 showing typical style priced at $79 (2001 was $95). 2010 not being released because it has shown a very fine microscopic sediment that the conscientious owners want to investigate. 3. Tokay-Oremus: Big holdings of 125 hectares in Hungary but only make about 50,000 bottles. Wonderful Mandolas fermented and aged in 100% new Hungarian oak from Furmint grapes in a dry mineral style from volcanic soils. Most wineries make 95% sweet but they are making about half dry and half sweet. 4. Pintia: “One and half hour drive from Ribera but so different”. Soil in Toro like Chateauneuf-du-Pape and elevation altitude important. No phyloxerra here and not American root stocks but old vines. Tendency for more colour and more tannins here from this arid region. Again they are able to achieve in a hot climate some delicate tannins and elegant not overripe fruit with the spice by picking early, putting 100% tempranillo grapes (Tinta de Toro clone) in a cold room at 5-7 C for 2 days to avoid volatile acidity, ferment at a cool 26-28 C for better aromatics, and 100% malolactic in barrel here. Use some 30-50% American oak with the French. Production of 2008 tasted was at 200,000 bottles priced at $59 (2002 was $75). 5. Macan: Newest project again with old vines in Rioja Alta near San Vicente de la Sonsierra trying to make something between the lighter structured traditional style and the popular modern international one. Not using 100% oak every year because still want some delicacy of the Rioja tempranillo expression to show through. Tried interesting young 2010 Macan at $89 with only 50,000 bottles produced. Note that Puri told me that in her opinion the 2004 & 2009 are best in Ribera Del Duero while 2005 & 2010 are best vintages in Rioja. Are you following the exciting Spanish wine explosion market? What wine region in Spain do you prefer? Have you tried any of these quality wines from Vega-Sicilia? What's your favorite Spanish wine region? I will be sharing my last bottle of 1970 Vega Sicilia “Unico” on May 18th at our Brown Wine Club meeting. 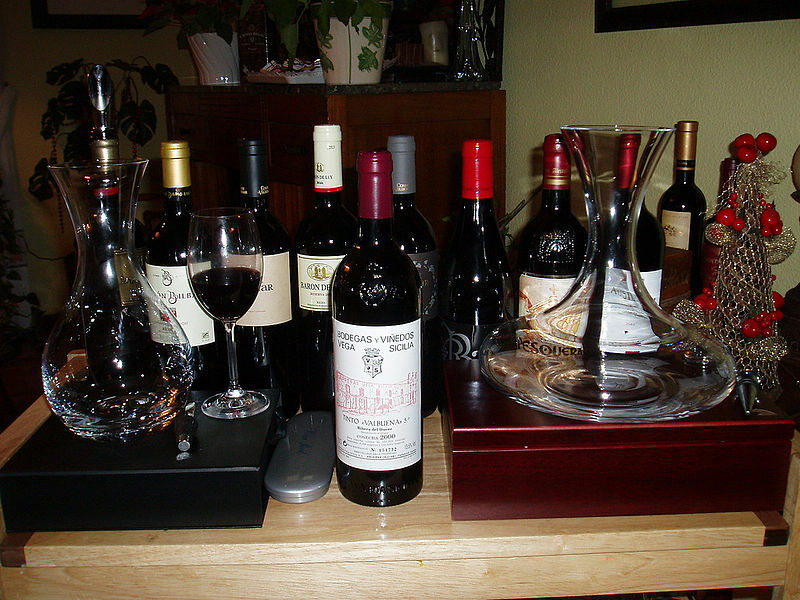 The theme for the tasting is old Spanish wines. It ought to be a great tasting of Spanish wines. I will post another reply after the tasting.